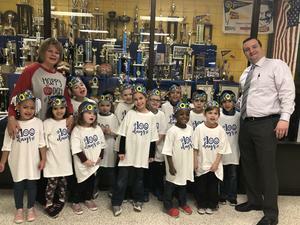 Congratulations to our 4th & 5th Grade First Lego League Team and Coach Meinert on winning the Robotic Excellence Award at the Tenacious Tiger Tech Tournament in Sharon, PA. First LEGO League challenges kids to think like scientists and engineers by building LEGO-based robots to solve real-world problems. We are celebrating all those who participated in this Library Event. Join us on Thursday, November 15th at 2:15 in the Cornell Elementary Cafeteria for an Ice Cream Party. 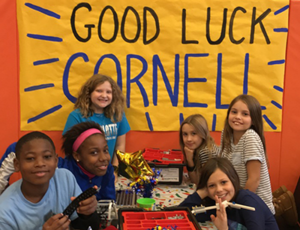 Welcome back Cornell Elementary students! First student day will be Monday, August 27. If anyone has questions pertaining to bus stop information please click on "Parents" tab and then click on "Transportation." Any other questions you can call the Cornell Elementary Office at 412-264-5010 ext. 141. See everyone Monday morning! Mrs. Roncone and Mrs. Pack took the 4th and 5th Grade Students to Duquesne University for the Stem Design Challenge. The Cornell School District is partnering with the AIU to offer a Pre-K program at Cornell Elementary next school year. Interested families can contact the AIU at 412-969-7503. Please see attached flyer for more information.